An international Indian Soccer League Team, North East Unitted FC, landed on our shores on Monday the 31st of August 2015. This is the first time that a professional soccer team from India has visited South Africa. North East United FC, is here on a 22 day visit as part of their season preparations. Whilst they are here, they will visit schools around Durban and conduct coaching clinics there as well. Several friendly games have been arranged for the club including Amazulu and Maritzburg United. 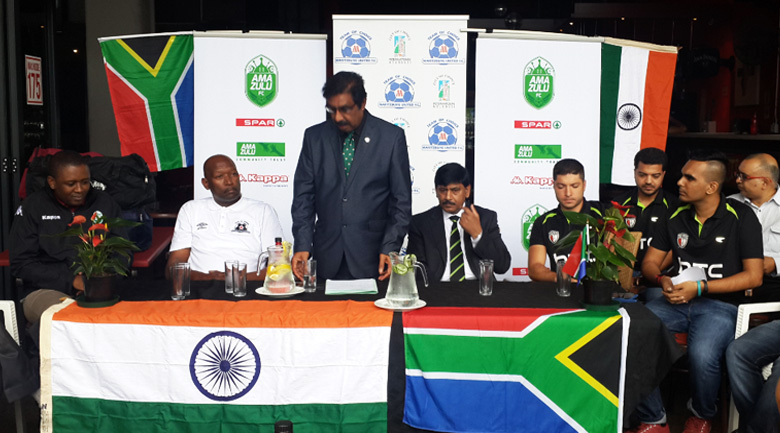 Maritzburg United Marketing and Communications Manager Brian Zuma, who addressed the conference on behalf of the Club, welcomed the Indian team “To the country that gave birth to the world’s icon, Nelson Mandela,”he chuckled to a round of applause. North East United FC will play Maritzburg United at Harry Gwala Stadium on Sunday the 6th of September 2015 at 3pm. Tickets are available from Thursday the 3rd of September at Computicket. They are R40 for adults and R20 for children.